This season of The Americans has allowed Martha to become the centerpiece of more than one episode, and the show is better off because of that. Martha is one of the easiest characters to feel for on this show (with Paige being the other), and the beauty of Alison Wright’s performance this season—and in this episode specifically—has been the way she’s turned Martha from a character we simply pitied to a character we genuinely care for. Martha is a normal person caught up in a tornado of lies and treason—all because she wanted to find love. And Wright never stops reminding you that Martha isn’t trained for this; she’s not Philip or Elizabeth, and she doesn’t have it in her genetic makeup like Paige does. For every moment of successful secrecy (like lying to Stan), Wright allows you to see the toll it’s all taking on Martha. I loved the way Wright played the moment after Stan left. Throughout his whole visit, you could feel Martha’s fear, which made it easy to appreciate the impressive way she was keeping it all just below the surface. And it broke my heart to see Martha’s emotional and physical exhaustion take over as soon as she closed the door. It was an example of the kind of deeply human vulnerability that’s made Martha a character the audience loves with a kind of fierce protectiveness. But for as great as Wright was during and after Martha’s run-in with Stan (and she was great), she was even better in the scene in which Martha calls her parents. That scene may have been one of the most relatable and genuinely moving scenes this show has aired in three seasons, and it was all because of Wright. There was something so relatable about the fact that Martha needed her parents when she felt like everything in her life was falling apart. And there was also something so relatable about her trying so hard to keep her emotions from overwhelming her but being unable to do so. There’s something about talking to mom and dad that often unleashes emotions you’re trying to bury. Watching Martha ask her parents if they could talk about something besides her marriage moved me to tears because it felt like such a believable, honest moment. The best actors are able to make moments of fighting back tears feel more emotionally resonant than full breakdowns, and Wright has been doing that all season. Martha’s storyline is once again at a crossroads, and once again I’m left hoping this character lives to see another day and get far away from the hell she’s found herself in. Every time Wright was onscreen in this episode, I had tears in my eyes. I felt Martha’s fear, I felt her exhaustion, I felt her desperation, and I felt her horror. Every emotion came from such an honest place, and my tears throughout the hour were a testament to the power of Wright’s performance. The Americans has always been a show about secrets and honesty, lies and truths . Who are we honest with? Why are we honest with them? Does the truth always set you free? Both Paige and Martha know varying levels of the truth now, but the truth has imprisoned them. (The garage door closing behind Paige and her parents reminded me of a cage or prison door closing.) And the truth hasn’t set Elizabeth and Philip free, either. Instead, it’s only given them more things to worry about. But sometimes the truth needs to be told. And Philip had to do some serious truth-telling in this episode. With both Paige and Martha, he addressed their very real and understandable concerns about his relationship with them by sharing the truth. The difference, though, came in what that truth revealed. For Paige, it was the admission that not everything she experienced was the lie she thinks it all is. For Martha, it was the admission that everything is even more of a lie than she thought. For as brilliant as the episode’s final scene was, I think my single favorite moment of the episode was Philip coming into Paige’s room with the pictures of their family. Throughout the episode, my heart was already aching for Paige and her belief that even the small amount of family she thought she had was a lie. Family means something to Paige, and I thought it was the right decision to have Philip share the pictures with her because family has always meant so much to him, too. We’ve always known Philip would choose his family over anything; that’s his truth. Despite the lies and secrets surrounding that family, the love in it has always been real for Philip (and it’s real in every way now for Elizabeth, too), and he needed Paige to know that. There might be a lot of lies she’s going to have to continue to deal with, but this was a moment of a father telling his daughter that the love her parents feel for her and her brother isn’t one of those lies. They are a family; that’s always been real. That’s been one of the defining thematic elements of The Americans since the show’s pilot: the reality of genuine love in the middle of a world of fake identities and lies. And the gentle, understated warmth Matthew Rhys projected in that scene blew me away. The contrast between the beautiful truth Philip shared with Paige and the harsh, soul-shattering truth he shared with Martha was brilliantly done. The final beats of the episode—with Philip slowly, methodically removing his “Clark” disguise—were simply stunning. There was so much going on in that moment, and Rhys and Wright conveyed it all so well in the loaded silences that make The Americans unlike any other show on television. The range of emotions Wright displayed with just her eyes cannot be understated. The way her expression went from softness as he took off his glasses to her confusion as he began to take off his wig to her absolute horror when Philip stood before her was incredible. In that moment, Wright allowed us to see Martha’s entire world fall apart. In her mind now, every moment—every happy memory—between her a Clark has been a lie. And even if Philip doesn’t kill her (or have someone else kill her), a part of Martha died in this moment. And watching that happen was almost worse than any other death we’ve seen on this show. Do I think Philip is going to kill Martha or have her killed by someone else (like Hans)? I honestly have no idea. The beauty of Rhys’s work in that final scene was that it was impossible to read. Part of me is worried because Betty’s death earlier this season might have been foreshadowing of what happens when the Jennings reveal their identities to a third party. But another part of me feels like Philip cares too much about Martha to directly harm her. While their life and their love might be a lie, Philip genuinely does care about her. And if nothing else, showing his true self to her felt like an extension of that caring—at least in his mind. If she has to die, at least she died knowing the truth and seeing Philip’s real face. But I’m still sitting here praying to the TV gods that she’ll somehow find a way out of this alive. • Philip and Elizabeth’s meeting with Abassin Zadran was chilling (almost as chilling as the murder of his fellow Afghan leaders). I was completely captivated by how much emotion Rhys was showing just under the surface as Zadran talked about killing Soviet soldiers. It was such a great way to connect Philip’s paternal emotions to another one of the episode’s storylines. • I have a feeling everything with Lisa and her husband is going to become a very big concern very soon, but I found it hard to focus on that part of the episode when so much was going on with Philip, Elizabeth, Paige, and Martha. • Was anyone else momentarily terrified by Elizabeth moving to physically silence Paige? It was such a horrifying moment of desperation for all involved, and I thought Keri Russell portrayed the rising tension in Elizabeth that made her feel like that move was necessary perfectly. • The scene between Claudia and Gabriel was everything I could have hoped for. Frank Langella and Margo Martindale are such incredible actors on their own, and they are even better together. That scene was full of such important revelations: Gabriel is more uncertain about recruiting Paige than he lets on to Philip and Elizabeth; the Center almost shut down Directorate S after what happened in the Season Two finale; and yet they still want to turn Paige into an asset. But what could have been just an expository scene was instead a moment of unexpected warmth and easy intimacy between two people with so much history together. 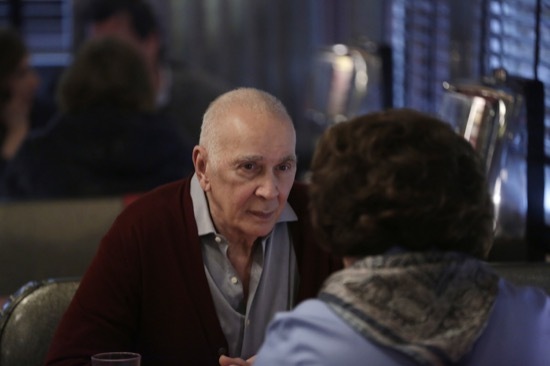 Langella and Martindale conveyed that history and familiarity with characteristic brilliance, and I hope that’s not the last scene we see between them. In a full season of strong episodes, I think the Martha centric ones have been my favorite. They have been heartbreaking, but my empathy towards Martha as a character is huge – greater than any other character on TV right now. She is literally living a horror story. Over these three seasons we have seen a love story go terribly wrong. As you said, all she wanted was to find love, she allowed herself to be vulnerable and open up her heart, and this is where it has led her. Not only has her marriage crumbled, her life is in the hands of the ‘enemy’. I want nothing more than for Martha to come out of this alive. I think she is a survivor and she could get over this trauma eventually, but at the same time, the risk of leaving her alive just seems too great. I love that this show has given us enough insight into Philip’s actions regarding Martha this season that we as an audience really have no idea what he is going to do. We understand if he has to kill her, but at the same time, we understand if he lets her go. I cant get over how perfect this tension is. Its one thing to ‘shock’ an audience with an unexpected death, but it takes a whole other level of finesse to give a cliffhanger like this where the audience really has no idea what is going to happen. You picked my two favorite scenes from this ep to talk about. I did love the scene between Philip and Paige, especially the little comment about Paige telling her dad that she had kept Henry’s secret all these years. But for me, the scene with Martha calling her parents was the winner in this episode. It was just such a human moment (similar to Martha trying not to cry at work when they found the bug). I have been there multiple times, when you feel like your world is upside down and you need the stability and safety that comes from your parents. And its in beautiful contrast to Paige, who doesnt have that feeling of safety that comes from talking to her parents anymore. I know every week I am gushing about how I love that this show has the guts to be slow in its tension, but its true every week. The number of minutes these characters are allowed to have extended scenes alone, sometimes completely dialogue free, has to be some kind of TV record. And I hope the show never stops having these moments, because they tend to be my favorite. How is this show so good?! Its going to be quite sad come next week and I wont have all these characters on my TV every week. I love what you said about Martha making you feel so much empathy, because I feel the same way. There’s just something about the incredible humanity Alison Wright brings to her performance that makes me feel so deeply for Martha. I haven’t wanted to save a doomed character with this kind of intensity ever. I have found myself laying awake at night trying to figure out ways the plot can work that would let her live, and I just don’t know how that can happen at this point. But the great thing about this show is it never follows conventional TV formulae (like you said with their sure-record number of extended scenes without dialogue), so I’m expecting the unexpected in this season finale. And I love that this show still allows for that, while I know what’s going to happen (or can figure it out pretty easily) on many of the other shows I watch. I feel like I should make a list of my favorite scenes on the show so far, because I’m also pretty sure most of them would be scenes without any dialogue. It’s a testament to how great this cast is, and how much trust the writers and directors have in the talent they’re working with. I agree with you on all of this. But the one thing that still sticks in my mind is HOW the Jennings’ children were conceived. They were not a product of two people in love wanting to start a family together. They were part of the perfect cover for two KGB agents in the US. I don’t know if the show creators have conveniently forgotten that now or if it will come up later. I have a feeling that Paige will feel even more deceived should that particular part be revealed. (Not to mention the fact that Elizabeth at one point even considered not keeping the baby that eventually turned out to be Henry!) And I know, once the children were born both parents probably instantly fell in love with them and couldn’t imagine not having them. But if we’re going by canon (S1), they didn’t fall in love with each other until some 15 years later. So the whole Happy Family Goes Camping rings a bit untrue to me. I definitely see where you’re coming from on the “not always one big happy family” front, but I don’t think this show is the kind to forget anything. I actually think the reality of Paige and Henry’s conceptions might not ever be revealed to Paige, and I don’t think it needs to be. Some secrets never get brought to light, and I think Philip and Elizabeth know now that the truth about why she was born would be the final crushing blow to her spirit. That’s why Elizabeth point-blank lied to her about always wanting her and Henry a couple of episodes ago. I think the Happy Family Camping Trip wasn’t so much about Elizabeth and Philip being in love as much as it was about them loving their kids in that moment. More than anything, I think that’s the truth Philip was trying to convey. They might not have conceived their children for the same reason most parents do, but by the time that camping trip took place, I do think there was genuine love in that family—at least between parents and children (and Henry and Paige). I don’t think Philip will kill Martha or have someone else kill her. Like you said, he cares about her too much to do that. But I think Gabriel will be the one to have Martha killed. He’ll see her as a loose end that needs to dealt with. Philip will do everything in her power to keep Martha from being exposed but in the end, it won’t matter. Martha will dead by then and Hans will likely be used as the instrument of her death.